Today is the historical feast of St. Robert of Newminster, who was born at Gargrave in Yorkshire. He spent the early years of his priesthood as rector of his home town, but later joined the Benedictine community at Whitby. In 1132 he helped to establish Fountains Abbey which embraced the Cistercian rule of St Bernard of Clairvaux. Fountains was to have a daughter abbey at Newminster near Morpeth and Robert became the first abbot in 1138/9. He died on 7'h June 1159. 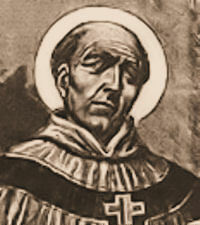 St. Robert was born at Gargrave, England, at the beginning of the 12th century. He studied at the University of Paris, was ordained priest and served as a parish priest at Gargrave. In 1132 Robert was a monk at Whitby England. News arrived that thirteen religious had been violently expelled from the Abbey of Saint Mary in York, for having proposed to restore the Benedictine rule. In the middle of winter, he left Whitmy to join them, living on the banks of the Skeld near Ripon., in a hut made of woven branches and roofed with turf. In the spring they went to Clairvaux, and for two years struggled in extreme poverty. Soon people heard of their sanctity. This brought another novice, Hugh, Dean of York, who endowed the community with all his wealth, and laid the foundation of Fountains Abbey. In 1137 Raynulph, Baron of Morpeth, was so taken and strengthened by the example of the monks at Fountains that he built them a monastery in Northumberland, called Newminster, of which Saint Robert became Abbot. The holiness of his life and his instructions guided his brethren to perfection, and within the next ten years three new communities migrated from this one house to become centers of holiness in other parts. He founded three other monasteries at Pipewell in 1143, Roche in 1147, and Sawley in 1148. 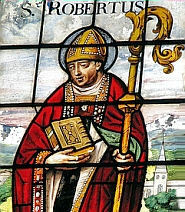 St. Robert was known for his kindness, austerity and holiness. He was a great man of prayer, a spiritual writer and exorcist. He led a strict way of life and fasted from food and drink, especially during Lent. One Easter Day his stomach, weakened by the fast of Lent, could take no food. Finally he consented to try to eat some bread sweetened with honey. Before it was brought, he changed his mind and sent the food, untouched, to the poor at the gate. The plate was received by a young man who took the bread and disappeared. St. Robert often visited a holy hermit, Saint Godric of Finchale. At the moment of Saint Robert’s death in 1159, Saint Godric saw his soul, like a globe of fire, taken up by the Angels in a pathway of light, while the gates of heaven opened before them. He took his name from Newminster Abbey, where he and his monks lived until his death on June 7, 1159.